I’d like to start by stressing that in terms of grief I don’t believe there is something to overcome, get over, and go through in some systemic manner, and there is no right and wrong way to grieve. Grief is a natural response to the loss of something or someone, and while it’s universal, the way it’s felt varies dependent on the individual. We grieve the loss of someone dear to us, a lost job, a family home that has been sold or burned to the ground, a relationship that has changed or ended, the seasons going, our youth and all it holds, our ability to do things for ourselves, the death of a celebrity we admired, and on and on. To live in a human body is to experience loss and grief and it seems no one goes untouched. After several years of studying death, dying, loss, and grief from various cultural, religious and spiritual perspectives I believe that it’s still one of the most misunderstood human responses even though everyone experiences it to some degree or another. 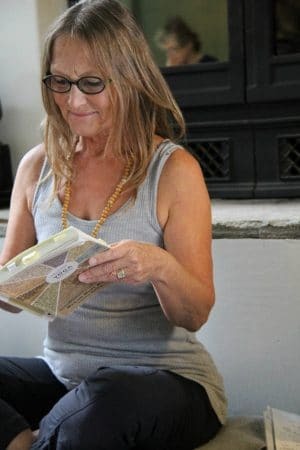 Over the years, I came to understand that while Yoga is not a universally accepted and embraced tradition, it does hold great potential to help us better understand ourselves and how we can befriend the psychological, physical, emotional, spiritual and social responses that we experience in life and especially as we learn to hold more heart-space for loss and grief. 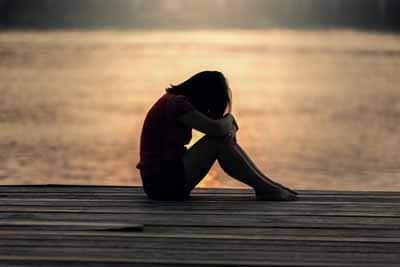 Grief allows us to have the most intimate relationship with ourselves and the world in which we live, and the opportunity for transformation through the process of softening into grief is why I refer to it as the yogic path of grieving. This unique path invites us to gently get into it rather than over it, and on that path we are re-introduced to parts of us we have forgotten about or packed away for a later date. It sometimes also shows us aspects of ourselves we didn’t know existed and that can feel physically, emotionally, and spiritually devastating at times. Through the practice of Yoga we are given the tools to greet the plethora of responses and gently reclaim ourselves so that we can experience ourselves as a loving whole being. When we look at grief through the various paths of Yoga we can see how each path holds a unique approach for us to experience loss and grief and reconnect to our true nature. Bhakti-Yoga calls us to feel deeply, to listen, to remember, and ultimately reconnect with love and devotion. 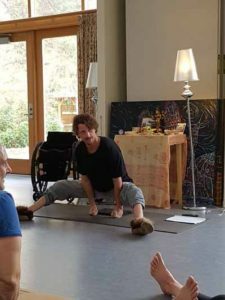 Karma-Yoga reconnects us to selfless acts as a way to open ourselves to living fully. Jnana-Yoga reconnects us to the ancient wisdom we hold deep within and offers a three-fold path of listening, considering, and contemplation to help us better understand our human responses to loss and grief. Mantra-Yoga reconnects us to our inner heart-song and gifts us the opportunity to find our voice again. Tantra-Yoga reconnects us to ritualism and celebration as a means to feel our deep connection to each other and the world we live in. Raja-Yoga reconnects us to the many facets of our mind to help us experience balance in our day-to-day life. 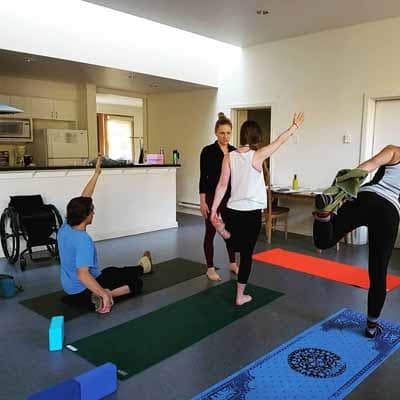 Hatha-Yoga reconnects to our body and helps us understand the deep connection between the body, mind, and spirit in our human form. As we offer acknowledgment and acceptance to grief we open to the parts of us that are holding painful and joy-filled memories and then we start to understand them as integral parts of ourself. We are called to turn toward grief and get into it as a way of honouring and respecting ourselves and our deeper connection to the world. In time, and through the yogic path of grieving, the body-mind integrates the experiences as part of the whole instead of seeing its separateness. When we allow ourselves to say “yes” in that way, a softening happens in the body and heart-mind and that gives rise to more opportunities. The softening is the embodied response to acceptance or saying yes to feeling grief. Obviously, there are times when “yes” doesn’t make sense such as when the emotions and physical sensations are heightened to the point where we can’t easily respond to them, but when we are able to say “yes” in a healthy manner we see how grief is woven into our inner landscape and we are called to learn to live with the addition not find ways to exclude it from our life experience. The yogic path of grieving also acknowledges the heart in its totality. It understands how our heart functions as a physical organ, how it responds as an emotional organ, how it listens as a spiritual organ, and how it connects as a social organ. It further acknowledges how the heart communicates with the entire body to give us a unique human experience in every moment, and when given an opportunity to soften it becomes the ultimate Mother as it opens its arms to love in its purest form. Lastly, yogic path of grieving calls us to return to ourselves to hold sacred space for the various losses we experience in life, and through the yogic practices we have the opportunity for an even deeper experience of living life with inner-freedom. Copyright 2019 by Brenda L. Feuerstein. All rights reserved. Reproduction in any form requires prior written permission. The Locust pose is a dynamic pose; a full body energizer and an excellent backbend for chest opening. The full pose is rather intimidating to most, but there are many ways to modify it so it becomes accessible. Here are a few progressions into the deeper forms of the pose. I like to start slow, with Sarpasana, or Snake Pose. • Lie flat on your stomach. Place your forehead on the mat, arms extended down the side of the body with palms down. Legs extend with the tops of the feet connected to the mat. Breathe. • Inhale and lift the head, shoulders and arms off the mat. Breathe. Inhale and lift the legs of the mat. Breathe a few breaths and lengthen through the spine. • When ready lower the legs, arms and head down. Optionally, I like to try to bring the arms out in front, as in Urdhva Mukha Navasana, or upward facing boat pose. • Lie flat on your stomach. Place your forehead on the mat, arms extended out in front of you. 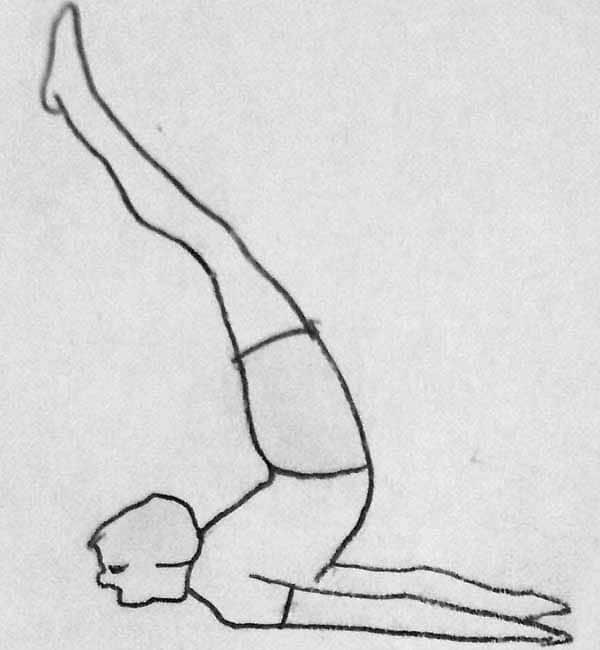 Legs extend with the tops of the feet connected to the mat. Breathe. • Inhale and lift the head and arms off the mat. Breathe. Inhale and lift the legs of the mat. Breathe a few breaths and lengthen through the spine. 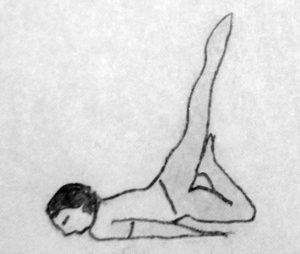 Next, we could explore the half locust, or Ardha Shalabhasana. • Place the palms down on the mat beside you, or make fists with them and draw them together beneath you, as close together as possible. • Inhale and raise the right leg. Breathe and hold for a few breaths. • Exhale and lower the right leg down. • Repeat on the other side, raising the left leg. We could explore how it feels in Eka Pada Ardha Shalabhasana, or one legged half locust. • Lie flat on your stomach, forehead down, and place your hands as stated above. Legs extend with the tops of the feet connected to the mat. Breathe. • Inhale and raise the right leg. Exhale and bend the left knee, folding the left leg so the foot rests against the thigh (or shin if necessary) as a support for the right leg. Breathe and hold for a few breaths. • Exhale and unfold the left leg and lower the right leg down. If you feel inspired, we could try Viparita Shalabhasana, or inverted locust pose, where both legs are lifted off the floor. • Inhale, then exhale as you raise both legs. Breathe and hold the pose for a few breaths. • There is a point where when the legs reach a certain height overhead, balance changes and it becomes easy to rest on the chest. Once stable at this point, bend the knees and lower the feet toward the head. Breathe and hold the pose for a few breaths. • Exhale and lower both legs slowly down. Repeat if desired, then breathe and rest. 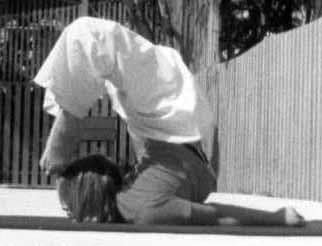 The final phase of Purna Shalabhasana, or full locust pose is the deepest backbend, and certainly not for everyone! • Inhale, then exhale as you raise both legs as high as possible with a little extra thrust. Press your hands firmly into the mat to help raise the legs. • Inhale and straighten the legs overhead. Exhale and slowly lower the legs back to the mat. Breathe and rest. Conclude the sequence of poses with child’s pose, pranatasana. Cautions: Back and neck problems. Modifications: Raise the legs one at a time, only an inch off the ground if that is what is most comfortable for you. An option in Sarpasana is to raise the upper and lower bodies separately, not at the same time. Pay careful attention to sensations in the spine. Again, stay within you realm of comfort and listen to the feedback from your body (your best teacher). Benefits: Creates “elasticity in the spine.” Strengthens the abdominal muscles and major muscle groups in the back and legs. Opens the thoracic spine and chest area. Massages the abdomen benefiting digestion. Promotes blood circulation. For some it can provide relief from sciatica. 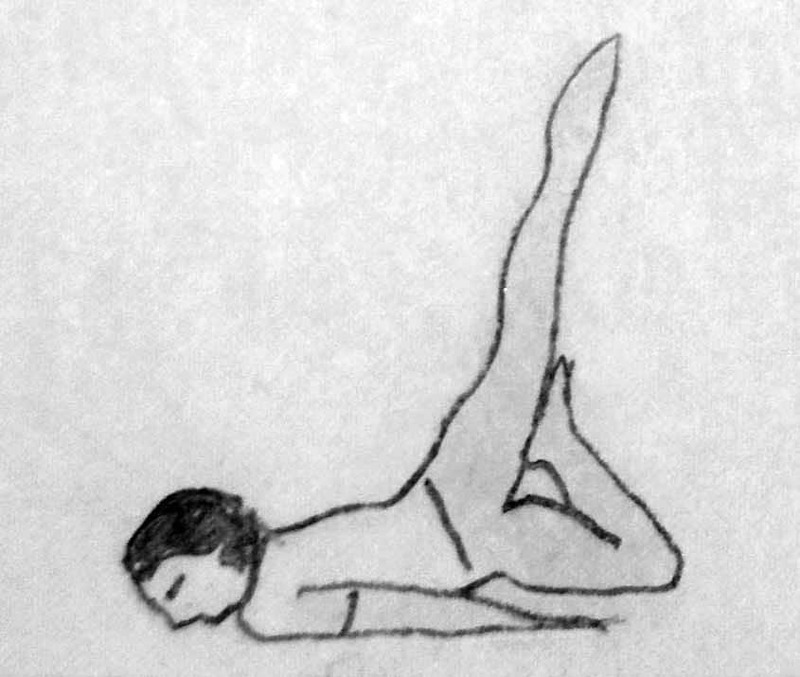 It is recommended to learn these poses in the presence of and under the guidance of a competent teacher. Please learn these poses from them, and then explore for fully in your own personal practice. Malasana is an excellent pose for transitioning from standing asanas to the floor. It opens the hips, improves balance, and is a great prenatal pose. In this photo, the hands are placed together in Namaskara mudra. However, the arms can also wrap around the knees, clasping the hands behind them, forming a garland or mala with the arms. Inhale, and exhale as you bend the knees, lowering yourself down into a squat position. Be sure your toes point in the same direction as your knees. Place your hands on the floor in front of yourself to help with your balance. Engage the abdominals slightly (a slight mula bandha and uddiyana bandha) to support the low back. If it is available to you, bring your hands together into Namaskara mudra (palms together) at your heart center. This joins ida and pingala nadis, or balances the energy of the opposites. Try to keep your spine straight, with your torso snuggled in between your thighs. Stretches the ankles, groin, hips, legs, back and torso. Low back discomfort, knee or ankle injuries, balance issues. Do not bend down as deeply if it gives you pain in the low back or in your knees. Feel free to put your hands on a wall or a chair to help with balance if you cannot squat down fully. If you are able to squat deeply into the full squat, give yourself permission to put your hands on the floor in front of you if you are unable to balance. If your heels come off the floor, place a folded blanket or roll up a portion of your yoga mat with enough thickness to put under your heels so they can comfortably rest on it. This will offer support for balance, allowing you to relax into the pose. A mala is a garland of 108 beads used to count the recitation of mantras. Mala is Sanskrit for garland. Malas are used in Eastern spiritual practices, but more than 2/3’s of the world population uses prayer beads in their spiritual practice including Christians (Catholic rosary), Islam, Buddhism and Hinduism. They are used as a meditation tool to count the number of mantras while chanting or reciting. Made of many different types of beads including gems, wood, seeds, bone, and crystal; there are different properties or qualities to the type of bead, and the choosing of a mala can be a very personal experience or sometimes gifted from your Guru or teacher. Some mala users prefer to make their own, reciting a mantra as they make it to imbue the mala with those qualities of the mantra. Yoga practitioners use malas in their mantra practice. A mantra is repeated to help create focus and to allow deeper levels of awareness and relaxation. As you move along the beads, it has the effect of ‘waking you up’ to the moment and to the mantra rather than it becoming mechanical. When not used in mantra, wearing the mala can help the wearer be mindful and have a sense of peace throughout the day. I have a few malas, and I may vary which one I use on the energy I may need that day. However, my most used mala is a very basic simple mala presented to me by my teacher Mugs at Yoga Teacher Training. 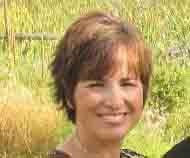 Gail Thompson, E-RYT500, is a Lead Trainer for SOYA Yoga Teacher Training in Creston, BC in the Kootenays. Bernie Clark has done it again. He has recently published another book explain the anatomy of yoga in ways never done before. This new release, Your Spine Your Yoga, is a comprehensive look at the spine both from both the scientific view and the yogic view. As yogis we understand that having a healthy, flexible spine is a critical aspect of yoga, both physically and energetically as this is the pathway of the kundalini shakti. What we often don’t understand is how to achieve a healthy spine. 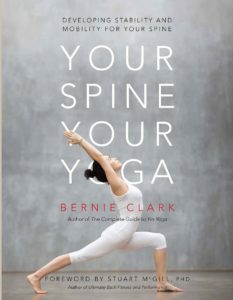 Bernie’s book goes into all the details on this, explaining how the spine provides stability through the core of the body as well as tremendous range of motion. 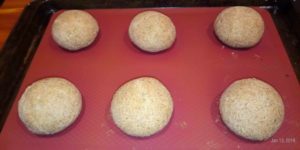 I really prefer to cook with almond flour rather than wheat flour, and have struggled to find a bun recipe that tastes good and holds together like wheat buns to make sandwiches or veggie burgers. This is the best almond flour recipe I have found so far! These are not vegan because egg whites are in the recipe. This recipe makes 6 dinner rolls. They only last so long without preservatives (3 days) so it is better to make smaller batches, or freeze them (and they freeze well). Preheat oven to 350F. Whisk together all the dry ingredients in a bowl. Add the hot water, vinegar and egg whites to the dry ingredients and quickly mix well with a wooden spoon. You will see how it changes texture so you can handle it. Wet your hands and form 6 buns in the shape you want them to bake (they don’t rise much). Place each bun on a silicone baking sheet or greased cookie pan. Bake for approximately 50 minutes and remove from oven. Cover the buns immediately with a clean t-towel to cool (otherwise they will fall). Enjoy!!! Altars can be built anywhere, and so many things can inspire us in building one. While moving into our Mexican winter rental accommodations, I noticed 3 nails already planted in the wall in a small corner of our apartment. Last summer, we received a thank you gift of three native pottery fishes from the Patzcuaro Lake area, and they were looking for a “home”. Innocently, I hung them on the existing perches. I had a hard time remembering the Sanskrit names of the five kleshas, or obstacles to enlightenment. 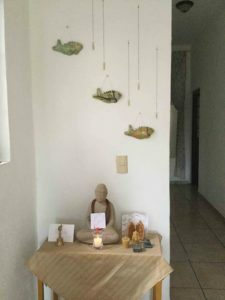 During meditation one morning, the idea of writing both the Sanskrit and English names for each, and dangling them from fish hooks in front of the fishes would mean that I would see and hopefully remember the names for each klesha in no time. It also meant that the five impediments to my growing up were a constant reminder. Buddha had to follow us from the old house. The perfect little table was moved under the fishes to ceremoniously receive the statue. Lovely cards from the last SOYA teacher training students in Mexico remind me of my gratitude at having spent more than two weeks with these fourteen very inspiring, dedicated now graduated alumni. Flat stones gathered at the beach pay homage to Ganesha and Lakshmi, my beloved guides. On the way to the kitchen early morning, I light the candle honoring God in Its multi-faceted forms. Inspiration for creating an altar can come from so many different things around you. Relax, breathe in peace and see what will show up. You will be surprised. My teacher Hari taught me this meditation, which is meant to help us find harmony in prakriti. Prakriti is nature, or all of the manifested Universe, which is subject to the effects of the three gunas. The gunas are the three potential qualities found in everything that is manifested. The three qualities are sattva (purity, light, harmony, and balance), rajas (activity and passion), and tamas (darkness and inertia). As an example, your asana practice can be perfectly harmonious and balanced (sattvic), or aggressive and potentially harmful (rajasic), or lazy and without any dedication (tamasic). One’s body and mind are prakriti, but the soul, the Atman, is not. This meditation helps us to come closer to who we really are. Hari learned this meditation from Gajanan Maharaj, who lived in or near Poona, India. Hari didn’t name it, but I call it “Sivoham Meditation.” You will find it on page 164 of the book Letters From The Yoga Masters, and you can be guided through a recorded version of the meditation under the techniques on the same website. Sit in siddhasana or your comfortable meditation seat and softly focus the eyes to the tip of the nose (nasagra drishti). Softly curl the tongue back into the modified khechari mudra (amritpan khechari) — the tongue is positive, the palate is negative, so this mudra creates a current of energy movement. Four mantras are repeated mentally. Sivoham comes from Siva. Siva is a name for God. Mentally say the first mantra once, Sudhoham. Ponder its meaning for several minutes. Mentally say it again, and ponder its meaning some more in a manner that you truly cognize what it means—I am purity. Mentally repeat Budhoham. Ponder its meaning for several minutes—I am all enlightenment. Mentally repeat Muktoham. Ponder its meaning for several minutes—I am free. Now add the mantra Sivoham. Repeat it mentally while you ponder the meaning—I am Siva; I am One with God. Continue with the process pondering the meanings of these mantras. An optional technique I like is to repeat each mantra over and over, as in japa, and then ponder their meaning. If you would like to try this format and be guided through it, visit the website Letters From the Yoga Masters under the Techniques, and scroll down to the Sivoham Meditation. Excerpted from Letters from the Yoga Masters: Teachings Revealed through Correspondence from Paramhansa, Yogananda, Ramana Maharshi, Swami Sivananda, and Others by Marion (Mugs) McConnell, published by North Atlantic Books, copyright © 2016 by Marion (Mugs) McConnell. Reprinted by permission of North Atlantic Books. Wisdom is not prominent in our time, which more values knowledge and information. Only very recently, perhaps because we are beginning to recognize the shortcomings of knowledge, has wisdom become an object of scientific (psychological) curiosity and investigation. Yoga, however, is packed with wisdom. The yogic masters may be somewhat ignorant in conventional terms, but they are full of wisdom. Therefore, we can confidently turn to them for wise help on the spiritual path. The teachings of the great Yoga masters are available to us in book form in the Bhagavad-Gita and the Yoga Sutra of Patanjali. Since wisdom is ageless, it is as relevant today as it was a thousand or more years ago. But we must be open to finding and applying that significance in our own situations. The outer circumstances have undoubtedly changed in the course of time. The mind, however, has remained quite constant, and the problems of an earlier age are often the same as today. In the state of ecstasy, which comes at the peak of the spiritual path prior to final liberation, or enlightenment, the practitioner knows everything as one. We realize that all things are interconnected. For our era, which is experiencing the first “inconvenient” consequences of a flawed attitude toward Nature, this recognition that “all is one” is important wisdom. While surprisingly large numbers of people experience ecstatic or ecstasy-like moments, presumably few of us will realize yogic ecstasy in a consciously generated manner. But we can heed the wisdom of the masters, which tells us that there are states of consciousness in which we can and do experience the unity of Nature firsthand. Their wisdom tells us, among other things, that in order to live peacefully and healthily, we must live in harmony with Nature. This is not what we have done in the past 200 years. We are now learning in a painful way that we were mistaken in thinking that Earth’s resources were inexhaustible. The few highly-industrialized countries have ransacked the world to build “civilization” to an artificial height. Our brothers and sisters in the large underdeveloped parts of the world are paying for our inconsiderateness and greed in many ways. Wisdom tells us that this is unjust, unscrupulous, and unwise. The spiritual path has been called a “razor’s edge.” A great deal of wisdom is required to tread it. Yoga gives us such wisdom. In particular, it shows us how to distinguish between the real and the unreal. At the ultimate end of the path is Self-realization, or actual enlightenment. For the sages of Yoga, unreal is everything that is not the Self, not pure awareness. This includes the mind. Even when it is steeped in wisdom, they regard the mind as falling short of the reality of the Self, which is our essential nature. The masters of Yoga understood that the mind exists, like the Moon, on borrowed light. The Moon does not give off heat or warmth but only reflected light, which comes from the Sun. If the Self is similar to the Sun, it makes sense to want to realize it. By itself, the mind cannot sustain us. But, so the sages tell us, the Self can, since it is our true identity. We only mistakenly identify with the mind. Many people even think that they are the brain-mind. Training in Yoga shows that identification with “brain-mind” alone is not the real story. It has been demonstrated scientifically that there are states of mind that clearly go beyond the brain. “Near-death experiences” are one example. They indicate that the brain can be totally disabled while mental states happily continue. Self-realization happens without the mind. Certainly awareness is ever present, yet the mind can come and go. This does not imply unconsciousness, however. The sages would not have aspired to this, as their goal has always been to realize the Self, which is the identity of every living being and even of the insentient natural world. The masters of Yoga discipline the mind in order to be able to consciously go beyond it. It is difficult to fathom their consummate skill in controlling the mind. When we sit down to meditate, the mind chatters on by itself. We cannot even imagine that the mind could stop for more than a few seconds at a time. Yet, this has been the experience of every Yoga practitioner who persists. The mind can become as docile as a puppy. Wisdom stands at both the beginning threshold and as the lofty goal of Yoga. At first, wisdom guides us to inner freedom. In the end, upon living liberation (that is, Self-realization while still embodied), the Self mysteriously inspires the mind to spawn wisdom for the benefit of others. Wisdom is the quality of a highly refined mind, which is replete with lucidity. For this to be the case, the mind has to be similar to the Self. That is to say, it must be as still and as luminous as possible. Even if the mind cannot produce its own light, it can reflect it. This reflected luminosity is wisdom. Brenda L Feuerstein is a world renowned yoga philosopher and author. 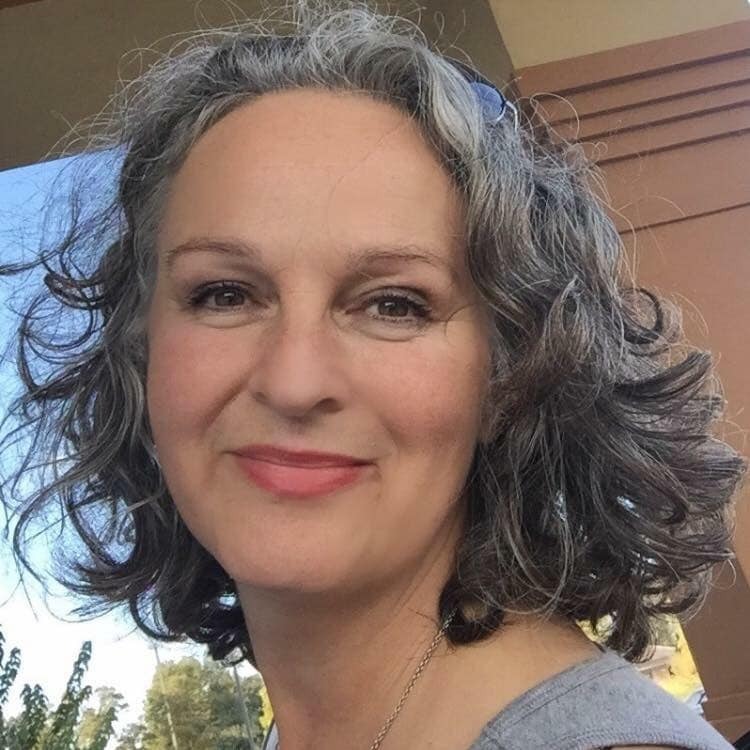 She will be leading the SOYA Annual Retreat in Sorrento, May 31-June 2, 2019. The article is from The Matrix of Yoga, by Georg and Brenda Feuerstein, used with permission, published by Hohm Press. 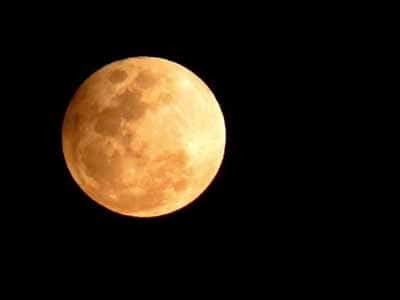 Moon photo credit goes to the lovely yogini Donna Conroy of Winnipeg, Manitoba. 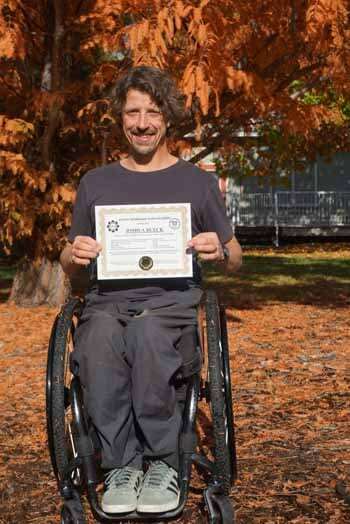 Joshua Dueck teaches adaptable yoga. He was a freestyle skier and coach before he broke his back on a ski jump. Since then he has become a Gold and Silver medalist in several Paralympic games. 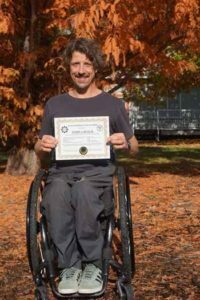 He decided he wanted to become a certified yoga teacher, and after his training completed, I asked him how he felt now about offering yoga classes. Here is what Josh had to say. Yoga teacher training has been a goal of mine for years, primarily to deepen my personal practice. Since first starting my practice in 2005, I have found it hard to find a studio or class that is suitable for my mobility, furthermore the great challenge has been to find a teacher who has experience or willingness to explore adaptable yoga, or yoga for all humanity. Undergoing the intensive training with SOYA has been mind expanding, heart melting and physically stimulating in ways indescribable. What I can say is that the feeling of joy is radiant, and has been much easier to process and share than any of my successes in sport. 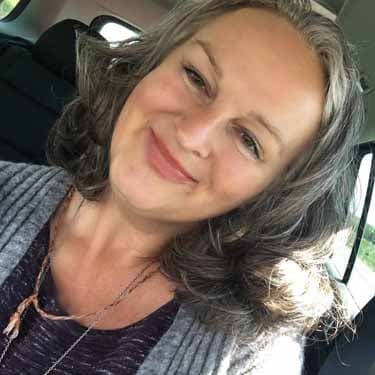 My primary focus as a teacher is to continue to live my practice and allow the yoga to do the real work; which is realizing the value of alignment, direction and purpose for those interested in deepening their mind body relationship. The community I am most drawn to work in is with people going through transition, primarily life altering injury. The transformation effects of yoga are profound on many levels, perhaps most notable on the subtle body. When a person experiences the neurological defects that come with Spinal Cord Injury, they often lose or disconnect with the parts of the body that fall below perceived sensation. The subtle or energetic body however is still intact and to see a person reconnect with their entire experience is expansive and uplifting. In other words a person paralyzed may shift from feeling a prisoner in their body (surviving) toward a place of curiosity and excitement with their body (thriving). Imagine the possibilities.